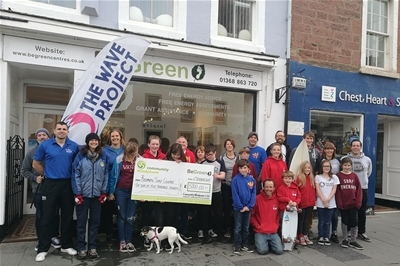 When BeGreen was asked to help fund an innovative heating system at Belhaven Surf Centre’s new building at Belhaven Beach it was, according to Anouska Wood, something of a ‘no brainer’. Belhaven Surf Centre is a ‘Not for Profit Social Enterprise’ formed to build and manage a new surf centre for long-term community benefit. With planning permission and building warrants now in place the construction phase has been reached after years of planning. ‘Ethically and environmentally the project – that should have started the early build process around the time East Coast Today is published – ticks all the boxes and will be a valuable addition to local amenities in the Dunbar area.’ explained Director, Brian Allen. ‘We initially explained our plans to Anouska Wood at BeGreen and she instantly understood the project’s potential for the greater community. You might say we had a meeting of minds. That made it much easier for us to outline our plans and ask for Community Windpower’s support. ‘Their backing was another box ticked on the way to delivering a community asset with great social advantages for the area. In this respect we will be expanding our work with ‘The Wave Project’ that helps young people who don’t quite fit socially or may have been excluded from school. We mentor these youngsters and teach them good habits. The social advantages are enormous. 'Then there are the health and environmental aspects, encouraging people to enjoy the beautiful surroundings here while respecting the environment. It's a unique mix. We will protect wildlife in the saltmarshes while teaching valuable skills in and out of the water. Belhaven Surf Centre will be much more than the name suggests: developing the sport while educating the growing surf and adventure community in safety. And in an environment where education and outdoor learning will be main components, working practices built on innovation and best practice will make for a first class learning experience. The centre will contain a multi-purpose education room, office, storage facilities, heated changing rooms and warm showers and this which is where BeGreen came in. ‘The £5,000 grant we have agreed to donate will go directly towards meeting the costs of new heating technologies such as air source, under floor heating and solar panels’, said BeGreen Community Co-ordinator Anouska Woods. The building will sit only 100 yards from the beach and will have two upper floor community meeting rooms. As the surf community grows it will become a focal point for surf performance, water safety and environmental education. And its close proximity to the water will make it an ideal home for improved safety equipment and enhanced first aid equipment for use along the beach. Active Users should include East Lothian Active Schools, East Lothian Countryside Rangers, Dunbar Surf Lifesaving Club and Coast to Coast Surf School among others.